The reason that some sections don't work so well was the classic academic writer's problem of not realising the importance of narrative and storytelling (which you'd think a practising magician like Gustav Kuhn would realise). The book comes alive when we are told about specific tricks or people or situations, but sometimes it becomes a collection of facts, a lecture on, say, a particular psychological trait, and then it can lose the reader's attention. 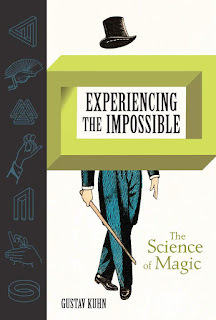 It's not that the psychology parts aren't interesting - and inevitably, apart from engineering, most of the 'science of magic' is about psychology and how the brain works (and doesn't) - but they need to be presented with much more context and more tying back to the magic that they are supposed to be illustrating. Similarly, it's not that the science is too heavy - if anything, we don't get enough of it. So, for example, Kuhn introduces a theory of Bayesian misdirection which I absolutely loved as a concept, but wasn't able to read much about. If you read the book to get the lowdown on how all the famous tricks work, you will be disappointed. Kuhn does explain a few very basic tricks, but mostly brandishes the magician's traditional veil of secrecy. This is a real shame and is another reason the book doesn't work as well as it could. You don't explain science by saying 'the researchers did an experiment, but I'm not going to tell you how it worked, just what it looked like' - but that's exactly what happens here. A great example is Kuhn's use of a Derren Brown illusion, where someone was given the choice of any toy in the huge toy store Hamleys, and Brown apparently predicted what the choice would be. Kuhn tells us that Brown 'explained' the trick by telling us it was due to repeated suggestions - but that this explanation doesn't hold up. We're then told 'Brown is one of my favourite magicians and I have no intention of revealing how his trick is done...' - but that's exactly what's required to make the book work. There's too much tease with no reveal. One other thing that I was surprised wasn't covered, perhaps because of the author's obvious love for magic, is its rapid decline as a popular adult entertainment. A couple of decades ago, magic shows were primetime TV fixtures. Now, magic tends to be much more niche. It may be that as we are so used to amazing CGI, we don't really care about illusion. Or something else. It would have been interesting to have seen a professional analysis of this. I don't want to give the impression that this book is devoid of interesting content. I repeatedly came on sections which really grabbed my attention, primarily those built around actual magical tricks. But it could have been so much better.